The way you spend your morning sets the stage for the rest of the day. A great morning ritual can be a powerful tool for creating a positive and productive day. It may sound extreme, but morning rituals can truly be life-changing – bringing your body and mind into balance and helping you to achieve your greatest potential in your relationships and chosen endeavors. A morning routine also helps prepare your body for food, priming your digestive tract and clearing the body of toxins prior to consuming the first meal of the day. It is best to wake at or before sunrise, which allows the body to synchronize with the sun. Waking early promotes proper elimination by allowing Vata to capitalize on the pre-dawn hours. Proper elimination also removes Kapha, which naturally accumulates overnight. The Vata nature of early morning also supports good meditation. If you find it difficult to wake naturally, or if you live in an area of the world where it is dark for much of the day in the winder, you can try out a light-based alarm clock. I use (and love) this clock – It has a gentle light that simulates the sunrise, with a soft instrumental sound that accompanies the light once it reaches full power. Rising early also allows you to watch the sunrise and experience the light it brings. Doing so brings balance and harmony to the body and mind, creating harmony in your experiences and interactions throughout the rest of the day. Awakening early is an important component of a powerful morning routine. Pay careful attention to bathroom habits. They can provide insight into your physical and emotional health. It is best to have 1-2 bowel movements daily. Three or more per day increases Vata and causes food to move through the digestive tract too quickly, preventing the absorption of nutrients from the food you eat. Fewer and one bowel movement per day is a sign of excess Kapha and leads to the accumulation of toxins, or ama, in the body. It can also be very helpful to examine urine and feces in the morning. It may sound very strange, but awareness of your body’s elimination process can provide a great deal of insight into the health of your digestive system and the body as a whole. Look especially for undigested food, which can be an indication of poor digestion and the presence of ama. If you do find undigested food, try to fast for the day or until digestion has recovered. If you are unable to fast or would prefer not to, favor easy-to-digest foods like kitchari or broth. Digestive issues can also be an indication of emotional imbalance. Loose stools or constipation can be a sign of anxiety or depression. In addition to taking care of digestion through food choices, be sure to meditate daily and maintain a regular yoga practice. Exercise and movement are beneficial in many ways. Exercise improves the immune system, increasing resistance to disease. It is also vital to increasing stamina, helps to reduce anxiety, and creates a sense of well-being through the release of endorphins. Exercise can happen at any time of day, but it has the greatest benefit in the morning. Morning exercise provides an energetic and positive start to the day. Depending on your constitution, some types of exercise are better than others. Pittas are drawn to intense, competitive exercise. This type of movement can feed Pitta’s natural aggressive nature and increase irritability and intensity. It is best for Pitta types to play team sports that allow for competitiveness but also require competition. Solo endeavors like backpacking are also an excellent option, funneling that competitive nature into self-competition. Yoga and Tai Chi are also very good due to their cooling nature. Vatas can easily become addicted to vigorous exercise, as the temporary exhaustion acts as a distraction from intrusive, hyperspeed thinking and temporarily increases their pain threshold. However, excessive intense exercise like jogging and running disturbs Vata and puts too much pressure on Vata’s inherently weak joints. Mild, contemplative exercise like walking, Tai Chi, or yoga is ideal for Vata types. Unlike Vatas and Pittas, Kaphas require vigorous exercise for optimal health and well-being. They are also the ones most likely to avoid exercise as much as possible. Kapha types generally require a lot of encouragement to get moving. They prefer routine exercise like cycling but do best with strenuous sports and activities that require complex movement and constant awareness. Ayurveda emphasizes the importance of not exhausting yourself with exercise. Doing so removes the benefit and drains energy from the body and mind for the remainder of the day and can eventually leave to chronic strain on the adrenal system. A general rule of thumb is to only exert half of your energy capacity at a time. It is also important to refrain from exercising when sick with a cold or when you are experiencing digestive issues or severe inflammation. Before bathing, inspect your tongue. A thick, which coating is a sign of poisonous ama in the digestive tract. A coating on the tongue often precedes disruptions in the quality of waste, allowing you to correct digestive problems before they become more severe. Use a tongue scraper or a metal spoon to scrape the tongue daily. Scrape slowly from back to front 5-10 times to remove as much of the coating as possible. Swish and gargle with salt water and a pinch of turmeric to keep the throat, mouth, and gums healthy. Banyan Botanicals also has a great Ayurvedic mouthwash that I love. Brush and floss daily to remove bacteria from the mouth. Be sure to brush gently in order to prevent receding gums and damage to tooth enamel. Twig toothbrushes are used traditionally in India, which floss the teeth while brushing. As most of us in the west use soft bristled toothbrushes that do not double as floss, it is important to floss daily. My favorite floss is a vegan option by Radius, and I prefer to use a wooden-handled toothbrush. Use a natural, fluoride-free toothpaste or toothpowder for brushing the teeth. I like to make my own using equal parts baking soda, calcium-magnesium powder, bentonite clay, and xylitol. If you prefer to purchase toothpaste, I highly recommend EarthPaste or the toothpowder from Primal Life Organics. Rinse the face with warm water, taking special care to clean the eyes and nose. Refrain from using soap, which is very drying and disrupts the skin’s natural balance. Rinse the nose with slightly salty water, then add a drop of jojoba oil to the inside of each nostril. This helps to prevent drying and cracking of the skin in and around the nose and is especially important to incorporate into your morning routine during the winter months. Rinse the skin with warm water. Refrain from using soap except on areas that are particularly dirty or smelly. Kaphas tend towards oily skin and can sometimes get away with using a very gentle soap. If you do choose to use soap, I really like this neem-based one. Vatas are prone to dry, fragile skin and should avoid soap as much as possible. Use organic, cold-pressed oil for moisturizing. Jojoba oil is a great option that works very well for most skin types. For more information, check out this post on skin care. Begin the day with meditation to balance the energy of the body and mind. Meditation can happen before or after exercising, but it is best to meditate after bathing if possible. At the very least, gently wash your face beforehand. In Ayurveda, meditation is viewed as a form of eating, in which the mind consumes and digests subtle energies. Without meditation, the mind remains hungry and seeks satisfaction from objects instead of from within. Control of desire, through regular meditation and mindfulness, is the key to health and longevity. Yoga and Ayurveda place great significance on the sun and on the color gold. It is most beneficial to view and meditate on the sunrise if possible, absorbing the magnificence of the sun and it’s ability to sustain life. Sungazing for even a few minutes each day can bring powerful change to the body and mind. If you are unable to view the sun, meditate by staring into a gold bowl or close your eyes and visualize the sun. If you are new to meditation and uncomfortable with and unguided practice, there are options for guided meditations. I really love the Headspace app, which has a variety of guided meditations for different functions and is a great option for beginners. Incorporate meditation into your morning routine in whatever way feels best to you. The health of the skin is closely tied to the health of the digestive tract, and consequently to the health of the entire body. The skin can be both an indicator of digestive disruption and an influence on the health of the digestive tract. The skin and digestive tract both control entrance into the system. When functioning well, they allow nutrients into the system and prevent pathogens from entering. Wastes can also be excreted through the skin and through the gut. In addition to helping with the removal of toxins from the body, massage is an important part of balancing the body through touch and keeping skin soft and healthy. Everyone needs regular massage to be optimally healthy. Self-massage is sufficient most of the time, but it is good to seek out professional massage occasionally. Vatas, in particular, need regular massage and should try to get a professional massage once a week if possible, or at least once per month. Massage benefits the body in many ways. The motion relieves joint and muscle stiffness, allowing body movements to become more free flowing. Massage increases blood circulation, which promotes efficient removal of metabolic wastes. It also relaxes the body in preparation for exercise and helps muscles recover from vigorous exercise. Incorporate a 10-15 minute self-massage as a part or your morning routine. An extensive morning routine may seem overwhelming at first. It can certainly be time consuming to practice extensive self-care every morning, and it is entirely worth it. The benefits will become apparent within a week if not after the first day. Taking care of the mind and body before embarking on the day’s activities is an incredible way to create positive energy and success in your life. Do you have a morning routine? What is it like? Please share any thoughts, questions, or ideas in the comments! Hello and welcome to Ayurveda Daily! 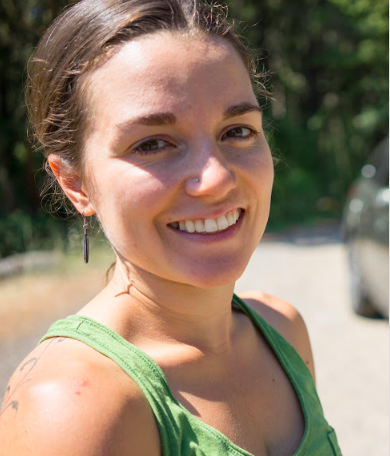 I'm Ellen - an outdoor enthusiast pursuing optimal health in the beautiful Pacific Northwest. I write about Ayurveda and ways to use Ayurvedic principles to heal illness, optimize health, and radiate well-being. I'm so glad you're here! Affiliate Links: Some of the links on this page may be affiliate links. The prices and products are exactly the same to you, and I get a small commission for any purchases you make. This helps me to support my blogging endeavors and bring you all of the Ayurvedic insight I can. Thank you for participating!